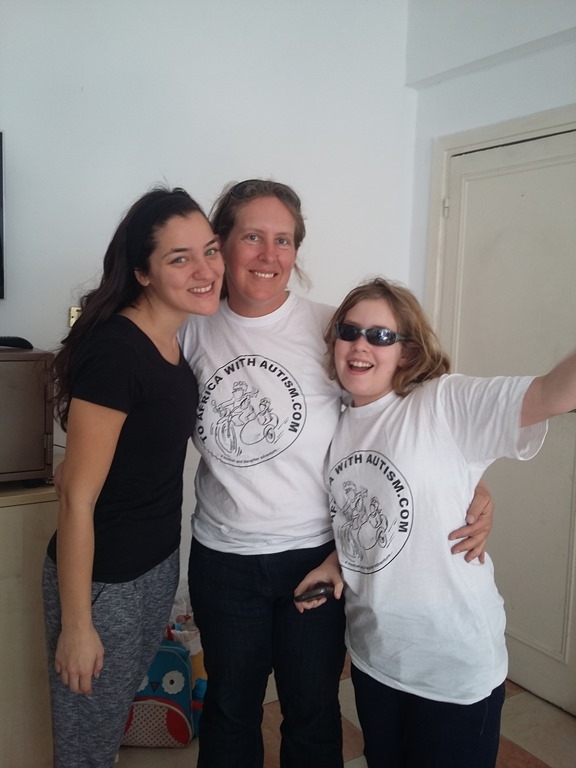 On our 4th day in Cairo, Sofia and I went to visit the Egyptian Autistic Society to find out more about autism in Egypt. 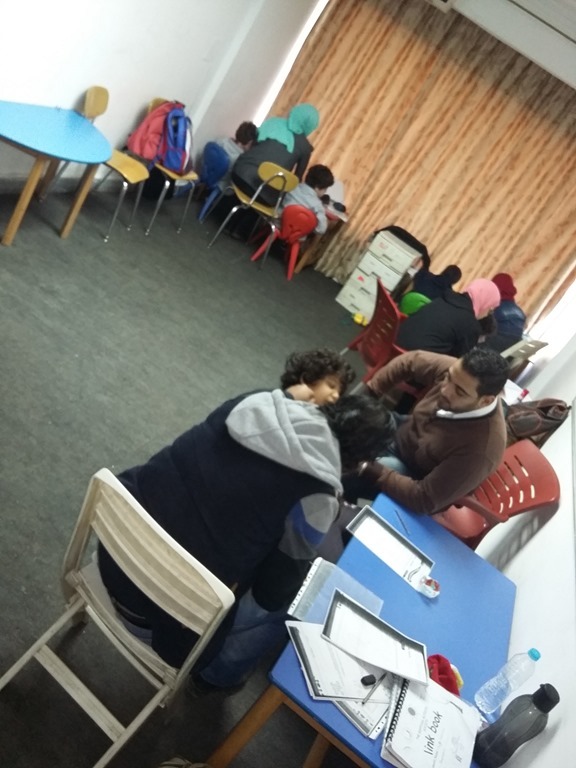 We were welcomed by Dina, who runs one of the class rooms at their centre just outside of central Cairo. She showed us around, and in fact there are only about 5 classrooms in total at their disposal, and an occupational therapy room, however, currently they don’t have a trained occupational therapist so often the room is used as a play area, assembly room, or when a child needs some time. Children will often spend half their day at the centre and the other half in their mainstream school, as the centre doesn’t have the resources to provide a full time facility, and are usually referred through the main stream school, or by the parents initiative. When they come seeking help they are assessed, and based on that assessment it is decided what support is needed. With such a small facility, an outreach program is run in the local schools, and generally the more severe cases will come to the centre to receive extra attention and a structured development plan that is regularly assessed. 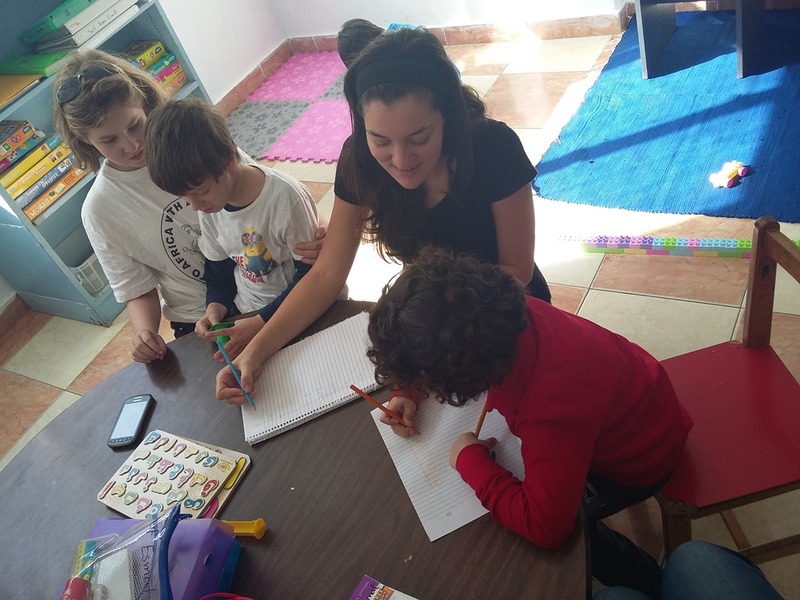 The primary goal is to enable to children to work in a mainstream environment as much as possible, and as such, many will often be going to international schools, so the requirement is often to learn the language of the school they will attend. This was fascinating to me as Sofia started preschool in France and struggled, not in a language confusion way, but she intrinsically wasn’t understanding language as a concept itself, it was just sounds to her, to which she ascribed meaning based on a situation she had seen. For example, when she was 3 years old, just before we moved back to England, she watch 101 Dalmatians. In this movie one of the puppies constantly stops, and when told to hurry up, he replies “I’m hungry”. For Sofia this meant that the phrase “I’m hungry” was refusal, so when she wanted to refuse she would say “I’m hungry”. Of course this would get confusing when she was refusing food! It was fantastic to see such amazing care and attention being given to the children at the centre, and the results of their success where evident in the classroom we visited with after our tour. But the challenges are evident as well. Autism as a condition, flies in the face of the face of cultural understanding and traditions regarding children in Egypt. Parents struggle to come to grips with the idea that changing parenting style can have an enormous impact not only on the out comes with the child, but that those more positive outcomes result in a far more content home life as a whole. I say this is a cultural thing, however, this is something that all autism parents struggle with, I think in the UK we just have higher level of awareness for the condition and therefore a greater potential to accept and make changes for autism. The centre obviously works with the parents and does what it can to help the parents make the adjustment. Sadly though, there is no training at this time or groups where parents can support each other, a very key aspect to parental survival! Harder than the parents however, is the training of staff and carers who find it harder still to change their ideas of what is good for a child. The support teacher in the class was in training, and as one of the children took a piece of bread from another’s lunch box, she took it back and returned it to the lunch box. Naturally. Dina stepped in and returned to the bread to the boy explaining that it was good that the boy had taken the bread and was touching and smelling it, particularly because the boy had a severe sensory issues around eating. The trainee, accepted this, but for her is was clear that it would be a long road to accepting that the sensory needs and development of a child were a higher priority than manners and social order and be able to work with it. Ultimately though the biggest struggle is getting the education out there to parents about autism, and giving them the strength to not only seek help but to cope with the attitudes of society around them and deal with the isolation that often comes with having a child that behaves differently. Talking about autism to a friend we made in Alexandria, he said that he had two cousins with autism who were now adults. His uncle solution, was to keep them indoors and not let them out. Indeed, the younger (a girl) had not been out of the house in the last 3 years. A sad story, and likely not uncommon. It is through awareness that we can start to change these ideas and give opportunity. We only had a few hours at the centre, and it would have been wonderful to have spent an entire day. Sadly we had to leave though, as a long awaited camel ride that had been promised to Sofia, needed to take place before we hopped on a train to Alexandria where the motorbike awaited us.